"FROM RIOTS TO RECOVERY". 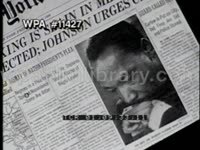 A documentary detailing the events that led to the riots in Washington DC on April 1968, and the area's socio-economic recovery. 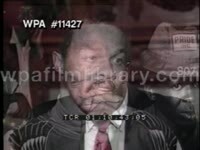 Much archival footage, some in B&W, most in color, duly noted as such in the description. John Hechinger saying that the city council in the late 1960's thought that a strong African American middle class would stabilize the communities. Stokely Carmichael saying that rioting was imminent for 1968, but MLK's assassination made it happen in April instead of in the summer. 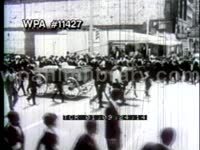 Martin Luther King funeral: coffin in mule-drawn cart in street, shot of mourners along parade route. 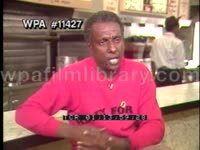 Stokely Carmichael talking about the panic among local black leaders as the news of King's death started to filter into the black communities. DO NO USE Archival still photo of young Marion Barry with bullhorn during the D.C. riots. 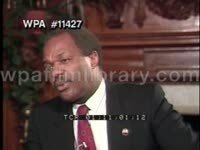 Mayor Marion Barry describing the gathering crowds after King's death, firebombing. 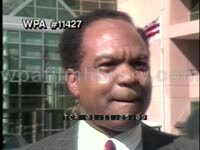 Walter Fauntroy, who led the D.C. branch of Southern Christian Leadership Conference (SCLC) in 1968, crossing street. Fauntroy pointing out the development of the riot around 14th and U streets and all over the city. Color. April, 1968. Washington DC. The riots after the assassination of Martin Luther King, Jr. Aerial of burning buildings. Police and firefighters trying to stop a building from burning. 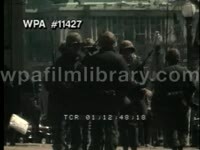 Aerials of fire trucks on fire scene, burning buildings, heavy outpouring of smoke; TLS of Ladder Truck hosing water onto roof of a burning building; MSs of police officers in riot gear cocking their guns, patrolling streets. 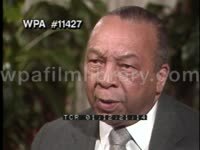 Former Mayor Walter Washington describing his no shoot policy during the riots. 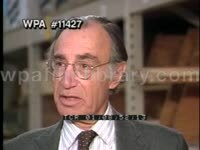 He says many thought the police should have shot looters. Color. April, 1968. Washington DC. The riots after the assassination of Martin Luther King, Jr. Riot police on streets. National Guard boarding a truck, deploying, troop carriers pulling onto freeway. National Guardsmen in a jeep using 2-way radio near burning storefront. Guardsman in helmet, gas mask, with rifle and bayonet, walking by camera. Capitol Dome, tilt down to MS squad of National Guardsmen on patrol. 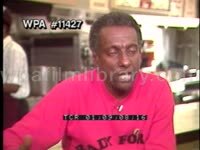 Stokely Carmichael saying that frustrated residents of the black ghettoes of Washington DC vented their frustration at the system. Color. April, 1968. Washington DC. 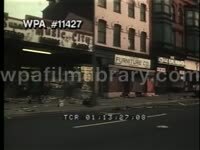 The riots after the assassination of Martin Luther King, Jr. Smashed window of storefront, tilt down to mannequin on floor. Police officers in riot gear restraining a black teenager. Cops throwing a suspect into a paddy wagon. Wide avenue with towering smoke in distance, slew of Guardsmen directing traffic. Young Caucasian relief workers handing out bags of food and emergency supplies. 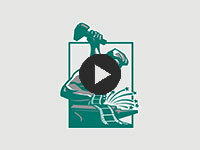 African American male workers sweeping up glass and ash from sidewalks. Travelling shot of the destroyed commercial strip. 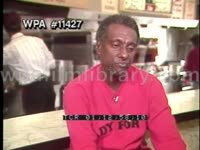 Stokely Carmichael saying the looting was justified, says that African Americans have always had to shed blood to get the right to eat, ride buses, vote, go to school, so he doesn't understand condemnations of rioting. No change has ever come without confrontation first. Color. April, 1968. Washington DC. 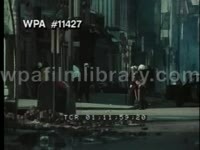 The riots after the assassination of Martin Luther King, Jr. Volunteers unloading a milk shipment and relief supplies from a truck, into basement; MS of black residents, mostly women, picking through boxes of donated clothes.